Mauchline Ware is a distinctive form of Scottish decorative treen, said to have originated in the Ayrshire (now Strathclyde) town of Mauchline in the late 18th or early 19th century. The wooden articles, generally known as Mauchline Ware, were made of Scottish planewood or sycamore (sometimes black lacquered) and were wide ranging in both design and purpose. The front surface was decorated with a painted or small transfer-printed view, portrait or building, and varnished over. These objects were a popular form of tourist souvenir in the 19th century, and the images depicted covered the whole of the British Isles. 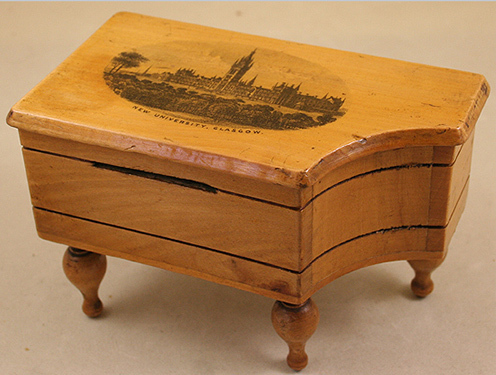 Many small items and a large variety of boxes may be found with the characteristic vignettes, the commonest being tea caddies, snuff boxes and pill boxes, trinket boxes, stamp boxes, rouge boxes, needle cases and étuis. In the early days, the pictures applied to the treen surfaces were either hand-painted or pen-worked. Around 1850, the application of transfer-printing was devised. By about 1860 photographic images became the preferred technique, thus producing more affordable pieces at a faster rate. Through the 1800s, Mauchline Ware was made in such towns as Mauchline, Cumnock and Lanark and also in Laurencekirk, in the north of Scotland. 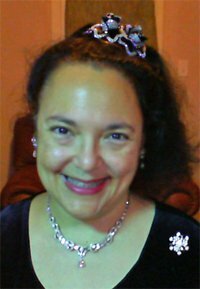 By the second half of the 19th century, W&A Smith of Mauchline was one of the first companies to exploit the growing tourist industry by making, for export, souvenirs that related to cities, resorts and spa towns in Europe, North America and South Africa. Although most types of Mauchline Ware are well documented, there is sparse mention of cased combs and an absence of references in the literature of the Mauchline Ware Collectors Club. 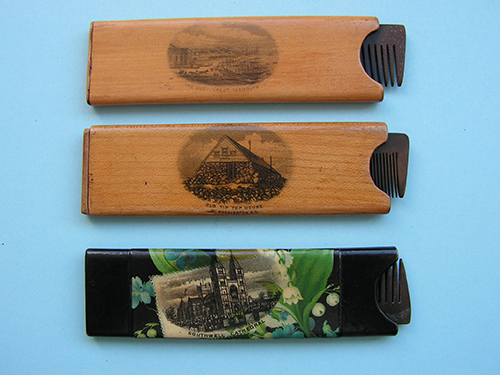 The three cases illustrated here measure just over 4 ins (10.5 cm) in length and not quite 1 ins (2.2 cm) in width. 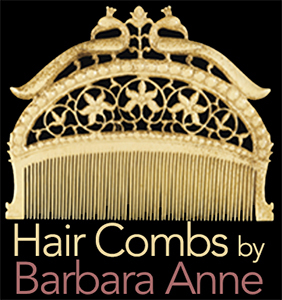 The combs, original to each case, are made of ebonite (vulcanite or hard rubber). 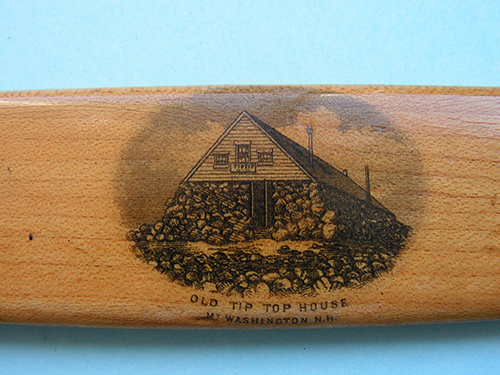 The image on one of the cases is that of Old Tip Top house, Mt. Washington, N.H. – a known design. This house was built near the summit in 1853 but was eventually replaced by the New Tip Top House sometime in the 20th century. Another case shows the quay at Great Yarmouth, Norfolk, England. 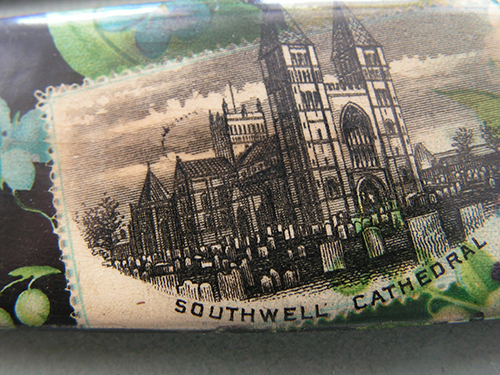 The image on the black lacquered case is that of Southwell Cathedral in Nottinghamshire, England. Very few Mauchline Ware pieces were marked with makers’ names. It is likely, however, that the Mt. 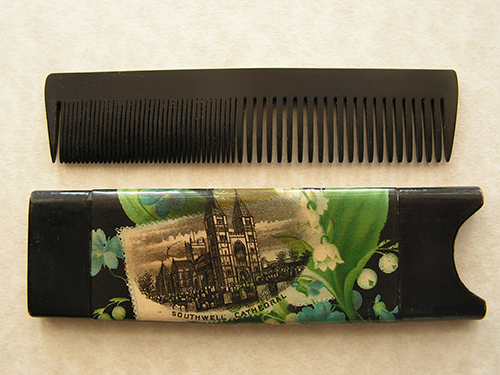 Washington example illustrated was made by the Smith factory in Mauchline and dates between 1885 and 1895, the peak period for the growth of tourism in New England. At that time the Boston based distributor of Mauchline Ware was Charles Pollock, described as an “Importer of White Wood Fancy Goods,” no doubt the agent for W&A Smith. An entry in the Company’s ledger, dated 1888, lists combs among the Mauchline Ware products although specific details are not known. This particular item was bought at a small antiques market in London in 1999 for £20 (about $35) and is in excellent condition. Unfortunately the original retail price is unknown.